BELIZE CITY, Mon. Feb. 22, 2016–The days of being able to buy a pound of retail rice or 5 pounds of retail rice are over. Last week the Belize Bureau of Standards (BBS) confiscated 27,571 pounds of rice, in marked 100-pound sacks, from the Belize City outlet of a rice producer in Shipyard, Orange Walk, on allegations that the enterprise was violating packaging and labeling laws introduced last year. 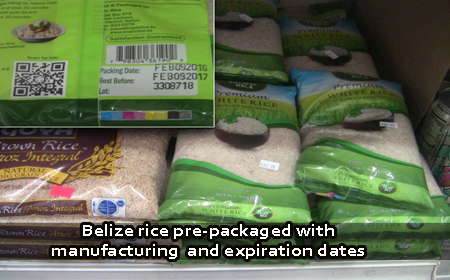 Rodolfo Gutierrez, consumer protection liaison officer, told Amandala that rice must be prepackaged for retail sale and those packages are required to have both an expiration date and a manufacturing date. The new standards also require manufacturers to state the grade of the rice and the amount being packaged. There are also price restrictions based on the grade of the rice, since the Government controls the price of this basic staple. Gutierrez said that not only will the new requirements make life easier for consumers; it also makes enforcement easier. Gutierrez reiterated that the sale of loose rice is no longer allowed. The BBS recently found out that rice was being retailed at the market, and that is when it decided to go after the rice producer, who has promised to rectify the matter. Had he not done so, Gutierrez said, “…we would have disposed of it.” He said that they will, hereafter, remove any retail rice found on the market. “The Bureau is aware that rice continues to be sold loosely in the market and in an effort to address the situation, it is seeking to correct it at the source. The BBS assures the general public that it will continue to monitor the market in an effort to carry out its mandate and to protect Belizean consumers,” a press release said. Gutierrez explained that rice producers had been given adequate notice of at least a month to transition to prepackaging rice. He said that there are 4 or 5 main rice producers, and only one failed to meet the new requirements. “He knew ahead of time what were the requirements. He did not meet them. He is forced to do it now,” Gutierrez said. He declined to name the producer, saying that they have received legal advice not to do so. We asked what penalties are generally levied for these types of infractions and were told that the cases are referred to the Office of the Director of Public Prosecution, who would then take them to court, where the matter of penalties would be determined. We understand, though, that an administrative fine system, similar to a ticketing system, is being considered.